For other uses of "Buryatia", see Buryatia (disambiguation). The Republic of Buryatia (Russian: Респу́блика Буря́тия, tr. Respublika Buryatiya, IPA: [rʲɪsˈpublʲɪkə bʊˈrʲætʲɪjə]; Buryat: Буряад Улас, translit. Buryaad Ulas, pronounced [bʊˈrʲɑːt ʊˈlɑs], Mongolian: Буриад Улс, translit. Buriad Uls) is a federal subject of Russia (a republic), located in Siberia in Asia. Formerly part of the Siberian Federal District, it is now part of the Russian Far East as of November 2018 in accordance with a decree issued by Russian President Vladimir Putin. Its capital is the city of Ulan-Ude. Its area is 351,300 square kilometers (135,600 sq mi) with a population of 972,021 (2010 Census). The republic is located in the south-central region of Siberia along the eastern shore of Lake Baikal. Lake Baikal - Buryatia covers 60% percent of the lake's shoreline. Over 80% of the republic's territory is located in the mountainous region, including the Baikal Mountains on the northern shores of Lake Baikal. The republic's natural resources include gold, tungsten, zinc, uranium, and more. Population: 972,021 (2010 Census); 981,238 (2002 Census); 1,041,119 (1989 Census). According to the 2010 Census, ethnic Russians make up two-thirds of the republic's population, while the ethnic Buryats are only 30%. Other groups include Ukrainians (0.6%), Tatars (0.7%), and a host of smaller groups, each accounting for less than 0.5% of the total population. 1 In 1926, the Buryat-Mongolian ASSR included Aga-Buryatia, Ust-Orda Buryatia, and Olkhonsky District. These territories were transferred to Chita and Irkutsk Oblasts in 1937. Consequently, the results of the 1926 census cannot be compared to the results of the censuses of 1939 and later. 2 17,019 people were registered from administrative databases, and could not declare an ethnicity. It is estimated that the proportion of ethnicities in this group is the same as that of the declared group. Unusual blue diopsidite skarn from the Dovyren Highlands, Buryatia. 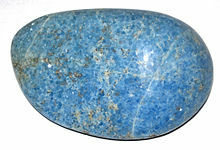 This tumble-polished rock is around 700my old. Mongolic-related Slab Grave cultural monuments are found in Baikal territory. The territory of Buryatia has been governed by the Xiongnu Empire (209 BC-93 CE) and Mongolian Xianbei state (93-234), Rouran Khaganate (330-555), Mongol Empire (1206-1368) and Northern Yuan (1368-1691). Medieval Mongol tribes like Merkit, Bayads, Barga Mongols and Tümeds inhabited in Buryatia. Today Buryat-Mongols populate the territory of Buryatia. The area of the present-day Buryatia was first colonized in the 17th century by Russians in search of wealth, furs, and gold. In 1923, the Buryat-Mongolian Autonomous Soviet Socialist Republic (Buryat: Буряадай Автономито Совет Социалис Республика; Russian: Бурятская Автономная Советская Социалистическая Республика) was created as a result of the merger of State of Buryat-Mongolia and Mongol-Buryat Oblasts. In 1937, Aga Buryatia and Ust-Orda Buryatia were detached from the Buryat-Mongolian ASSR and merged with Chita and Irkutsk Oblasts, respectively. In 1958, the name "Mongol" was removed from the name of the republic. The Buryat ASSR declared its sovereignty in 1990 and adopted the name Republic of Buryatia in 1992. However, it remained an autonomous republic within the Russian Federation. 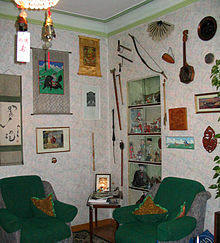 Modern Buryat home with instruments, scrolls, and weapons typical of Buryatia. The head of the Republic is the Head (formerly President), who is elected by the voters of the republic for a four-year term. From 2004 to 2012 the head of Buryatia (along with all other heads of regions in Russia) was nominated directly by the Russian President. Between 1991-2007, the President was Leonid Vasilyevich Potapov, who was elected on July 1, 1994, re-elected in 1998 (with 63.25% of votes), and then re-elected again on June 23, 2002 (with over 67% of votes). Prior to the elections, Potapov was the Chairman of the Supreme Soviet of the Republic—the highest post at that time. The current Head of the Republic is Alexey Tsydenov, who was elected by popular vote on 10 September 2017. Prior to this he was acting Head, having been appointed by Russian President Vladimir Putin in February 2017. The Republic's parliament is the People's Khural, popularly elected every five years. The People's Khural has 66 deputies and is currently dominated by the country's ruling party, United Russia, with 45 seats. Tsyren-Dashi Dorzhiev has been Chairman of the People's Khural since August 2015. The Republic's Constitution was adopted on February 22, 1994. The republic's economy is composed of agricultural and commercial products including wheat, vegetables, potatoes, timber, leather, graphite, and textiles. Fishing, hunting, fur farming, sheep and cattle farming, mining, stock raising, engineering, and food processing are also important economic generators. The higher education institutions of the republic include Buryat State University, Buryat State Academy of Agriculture, East Siberian State Academy of Arts and Culture, and East Siberia State University of Technology and Management. Traditionally, Buryats adhered to belief systems which were based on the deification of nature, belief in spirits and the possibility of their magic influence on the surroundings. They were led by shamans, who systematized tribal beliefs and cults. From the second half of the 17th century, beliefs and cults in the shamanic form were displaced by Buddhism, which became widespread in ethnic Buryatia. By the end of the 19th century, the majority of Buryats were part of the Buddhist tradition. A synthesis of Buddhism and traditional beliefs that formed a system of ecological traditions has constituted a major attribute of Buryat culture. As of a 2012 survey 27.4% of the population adheres to the Russian Orthodox Church, 19.8% to Buddhism, 2% to the Slavic Native Faith, Tengrism or Buryat shamanism, 4% declares to be unaffiliated Christian (excluding Protestants), 1% are Orthodox Christian believers without belonging to churches or are members of other Orthodox churches, 1% are members of Protestant churches. In addition, 25% of the population declares to be "spiritual but not religious", 13% to be atheist, and 10.8% follows another religion or did not give an answer to the survey. Tibetan Buddhism and Orthodox Christianity are the most widespread religions in the republic. Many Slavs, who constitute around 67% of the population, are Russian Orthodox. Since the breakup of the USSR in 1991, a small number have converted to various Protestant denominations or to Rodnovery, Slavic native faith. There are also some Catholics among the Slavs. Most of the Germans (0.11% of the population) are also Orthodox, so are some other non-European groups like Armenians (0.23%), Georgians (0.03%), and Soyot (0.37%). Buryats constitute 30.04% of the total population. Most urban Buryats are either Buddhist or Orthodox, while those in the rural areas often adhere to Yellow shamanism, a mixture of shamanism and Buddhism, or to Black shamanism. There are also Tengrist movements. Siberian Tatars are around 0.7% of the population. However, due to isolation from the main body of Tatars, many of them now are either non-religious or Orthodox. Islam is followed by immigrant groups like Azeris and Uzbeks, who constitute another 0.7% of the population. 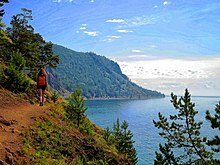 Lake Baikal is a popular tourist destination, especially in summer. ^ "Демографический ежегодник России" [Demographic Yearbook of Russia] (in Russian). Retrieved 2017-10-19. ^ Shimamura, Ippei (2014). The Roots Seekers: Shamanism and Ethnicity among the Mongol Buryats. Yokohama, Tanagawa, Japan: Shumpusha Publishing. ISBN 978-4-86110-397-1. Leisse, Olaf; Utta-Kristin Leisse (September 2007). "A Siberian Challenge: Dealing with Multiethnicity in the Republic of Buryatia". Nationalities Papers. 35 (4): 773–788. doi:10.1080/00905990701475178. Wikimedia Commons has media related to Buryatia.